Cardiac sarcoidosis is diagnosed in 2-5% of patients with systemic sarcoidosis. However, some reports are showing that the incidence of cardiac sarcoidosis in the US may be as high as 20-30% in sarcoidosis patients. For the patients who go undiagnosed, the repercussions can sometimes be fatal. 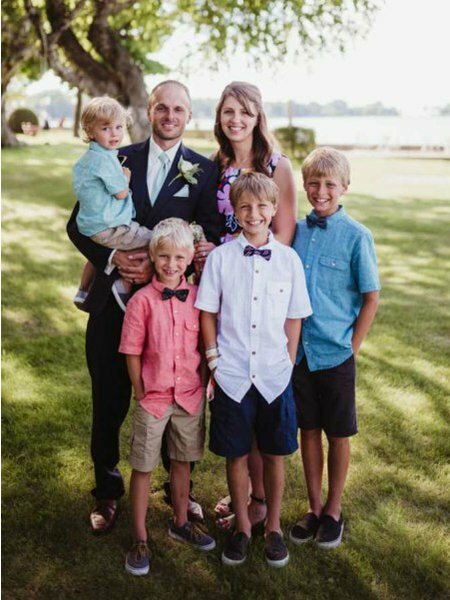 Wendy Ullmer, a 36-year-old from Wisconsin was unfortunately one of those cases, leaving her husband and their four young boys devastated by her loss. Read her story and learn the signs and symptoms that indicate you should talk to you doctor about screening for cardiac involvement. Several news outlets including People Magazine recently reported on the heartbreaking story of Wendy Ullmer, a 36-year old woman from Wisconsin who died in her sleep in March of last year. Her unexpected death left her husband with countless questions and their four young boys devastated by the loss of their mother. Wendy’s autopsy later revealed that her cause of death was cardiac sarcoidosis. She had never been diagnosed, though she did have a history of heart palpitations. While Wendy’s story is shocking and tragic, it is unfortunately not the only one of its kind. Sudden death is thought to be the second most common cause of mortality in patients with sarcoidosis in the United States; one study indicated that cardiac involvement accounts for 13–25% of disease-related deaths. How common is cardiac sarcoidosis? Cardiac sarcoidosis (CS) is diagnosed in between 2-5% of patients with systemic sarcoidosis (sarcoidosis in other parts of their body.) However, some reports are showing that the incidence of cardiac sarcoidosis postmortem in the US may be as high as 20-30% in sarcoidosis patients, indicating that there is much room for improvement in diagnostic methods and risk awareness. Studies have found that cardiac sarcoidosis is far more common in Japan than in Western countries; more than 50% of sarcoidosis patients in Japan have cardiac involvement. Unfortunately, because CS is rarer than manifestations like pulmonary sarcoidosis, physicians and researchers only have a small population to study, making it difficult to learn the basics about the disease. This lack of high-quality research on CS complicates the process of treating the disease. What are the symptoms of cardiac sarcoidosis? How is cardiac sarcoidosis diagnosed? If you or your doctor believe you may have signs of cardiac sarcoidosis, there are several steps you can take. First, a doctor will want to know if you’re having the above symptoms, particularly heart palpitations or syncope. If they’re suspicious of CS, they will likely do an electrocardiogram (EKG/ECG) to assess heart rhythm and blood flow or an echocardiogram (Echo) which is like an ultrasound of the heart. They may also have you wear a device called a Holter monitor, which is a portable device that monitors your heart activity for a period of 24-48 hours and can detect arrhythmias. If the results of these test are abnormal, your doctor may suspect cardiac sarcoidosis and will move on to imaging of the heart. Current imaging methods for CS include FDG PET scans and cardiac MRIs, sometimes called a CMR. The interpretations of these imaging tests will usually reveal whether there are sarcoid granulomas present in the heart or not. While a biopsy is often considered the “gold standard” for diagnosing sarcoidosis in other organs, heart biopsies are not as common because it can be difficult to ensure that the affected areas of the heart are included in the biopsy, which is only a few millimeters thick. How is cardiac sarcoidosis treated? Cardiac sarcoidosis can be treated through immunosuppression (like steroids) to decrease inflammation in the heart and potentially prevent the disease from progressing. A pacemaker or an implantable cardioverter defibrillator (ICD) may be recommended to prevent irregular heart activity or cardiac episodes. Anti-arrhythmia medications may also be used. In advanced cases of CS that lead to heart failure, a heart transplant may be need to be considered. Researchers are working to improve diagnostic tools for cardiac sarcoidosis, and FSR’s CSN will soon play an integral part in that progress. Our Clinical Studies Network for the 2018-2020 grant period includes 12 sites, two international and ten US-based. One of the core studies that will be conducted at all sites starting early next year focuses on cardiac sarcoidosis. This prospective observational registry will combine ideas from Dr. Daniel Culver of the Cleveland Clinic and Dr. Muhunthan Thillai of Royal Papworth Hospital in the UK to study the usefulness of standard cardiac sarcoidosis screening and assessment. Large amounts of patient data will be collected, allowing our CSN investigators to analyze the effectiveness of various screening strategies and tests currently used to detect cardiac involvement in sarcoidosis patients. See more information on the FSR Clinical Studies Network and participating research sites for the 2018-2020 cycle. For more answers about cardiac sarcoidosis, see our Cardiac Sarcoidosis FAQs blog written by Dr. Edward Miller, MD of Yale. Kandolin R., Lehtonen J., Airaksinen J., et al. (2015) Cardiac sarcoidosis: epidemiology, characteristics, and outcome over 25 years in a nationwide study. Circulation 131:624–632. Mehta, D., Mori, N., Goldbarg, S.H., Lubitz, S., Wisnivesky, J.P., Teirstein, A. Primary prevention of sudden cardiac death in silent cardiac sarcoidosis: role of programmed ventricular stimulation. Circ Arrhythm Electrophysiol. 2011;4:43–48. Silverman KJ, Hutchins GM, Bulkley BH. Cardiac sarcoid: a clinicopathologic study of 84 unselected patients with systemic sarcoidosis. Circulation 1978;58:1204–11. Slart R, Glaudemans A, Lancellotti P, Hyafil F, Blankstein R, Schwartz RG, et al. A joint procedural position statement on imaging in cardiac sarcoidosis: from the Cardiovascular and Inflammation & Infection Committees of the European Association of Nuclear Medicine, the European Association of Cardiovascular Imaging, and the American Society of Nuclear Cardiology. Eur Heart J-Cardiovasc Imaging 2017;10:1073-89. Have a sarcoidosis story you want to tell?